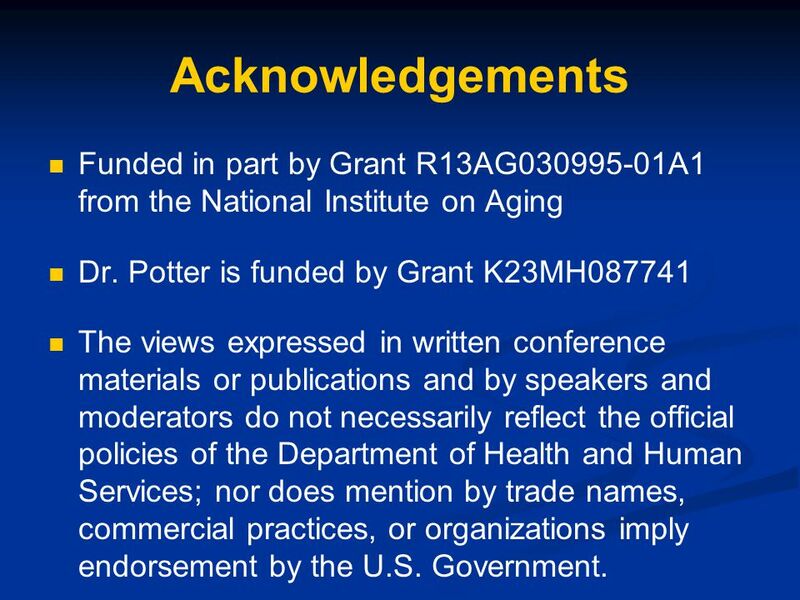 2 Acknowledgements Funded in part by Grant R13AG A1 from the National Institute on Aging Dr. Potter is funded by Grant K23MH087741 The views expressed in written conference materials or publications and by speakers and moderators do not necessarily reflect the official policies of the Department of Health and Human Services; nor does mention by trade names, commercial practices, or organizations imply endorsement by the U.S. Government. 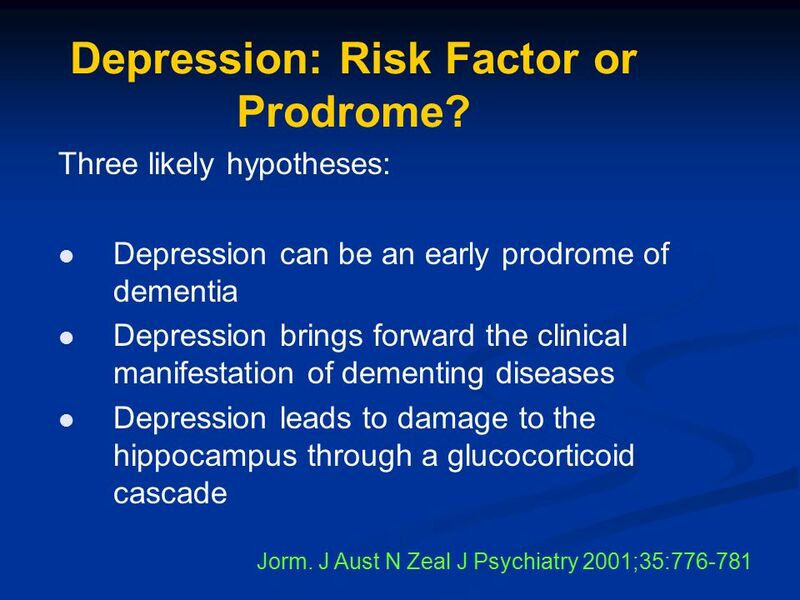 18 Depression: Risk Factor or Prodrome? 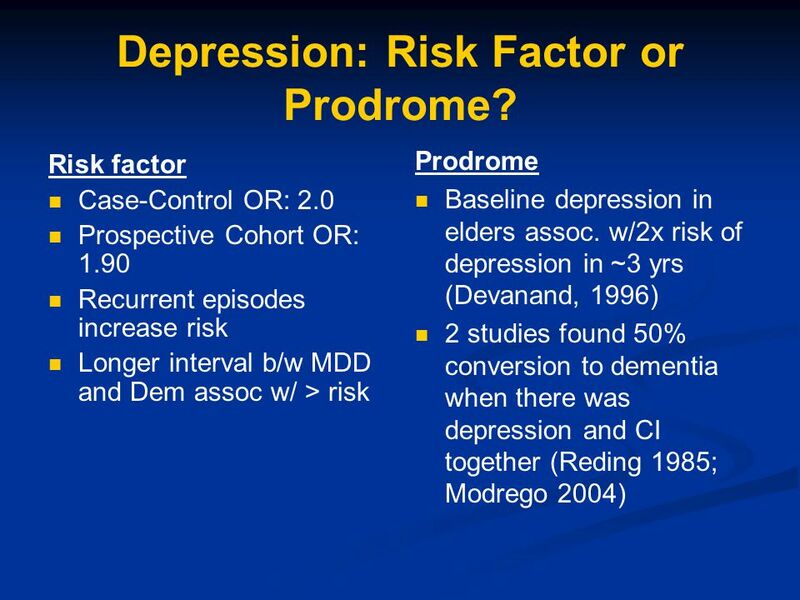 19 Depression: Risk Factor or Prodrome? 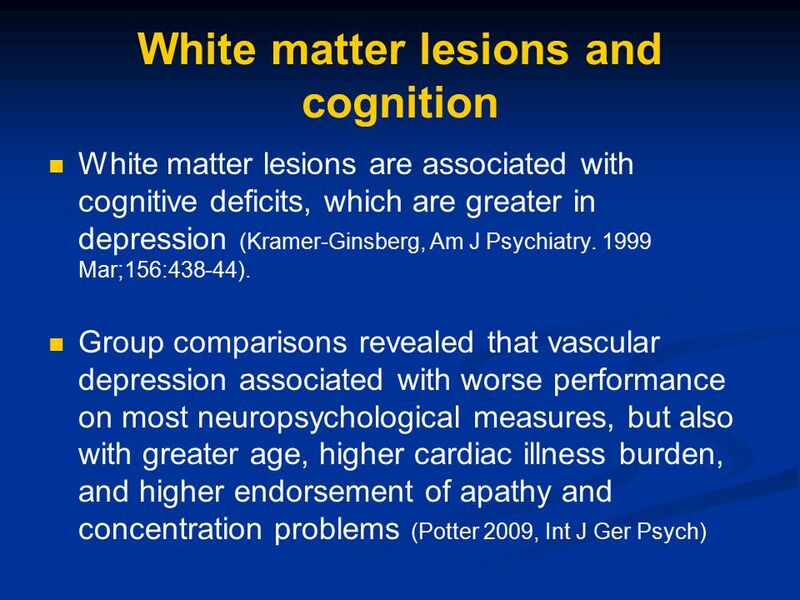 Cerebrovascular pathology impairs mood-related circuits, leading to depression Seventy-five (54%) of the subjects met neuroimaging criteria for subcortical ischemic vascular depression (SIVD). 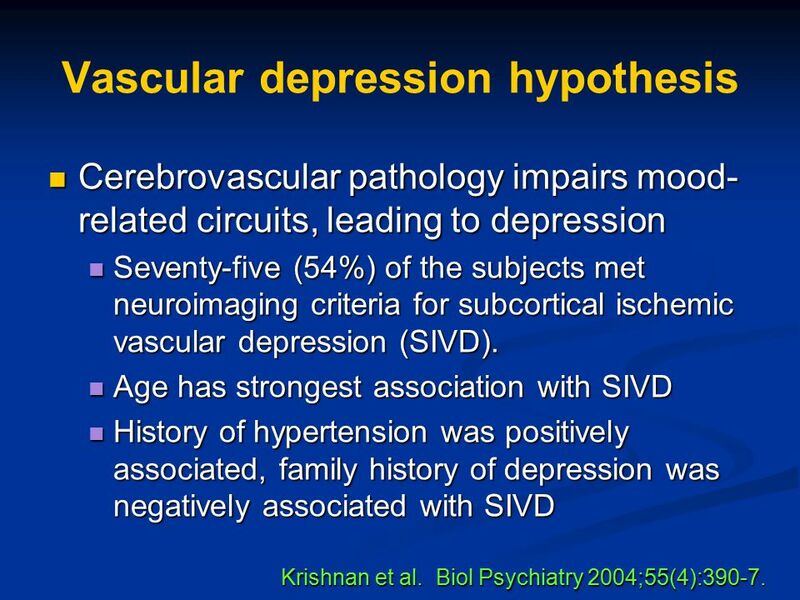 Age has strongest association with SIVD History of hypertension was positively associated, family history of depression was negatively associated with SIVD Krishnan et al. 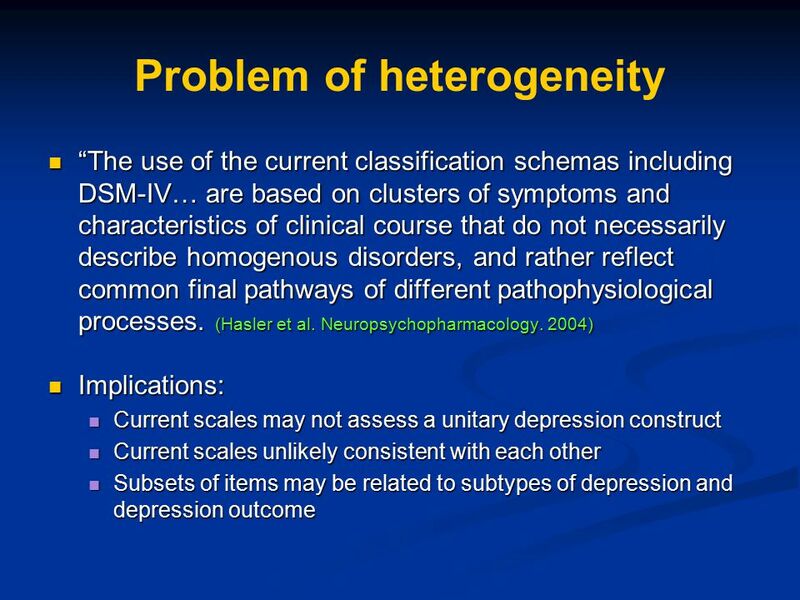 Biol Psychiatry 2004;55(4):390-7. 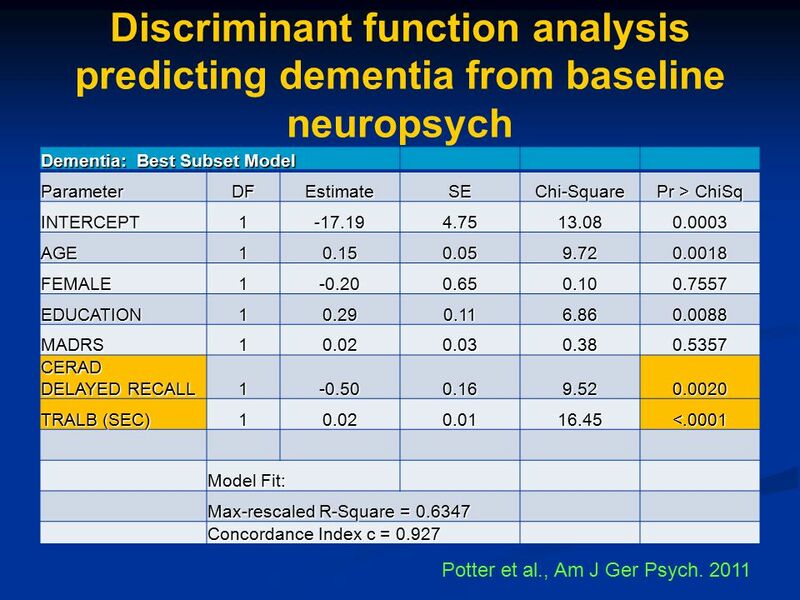 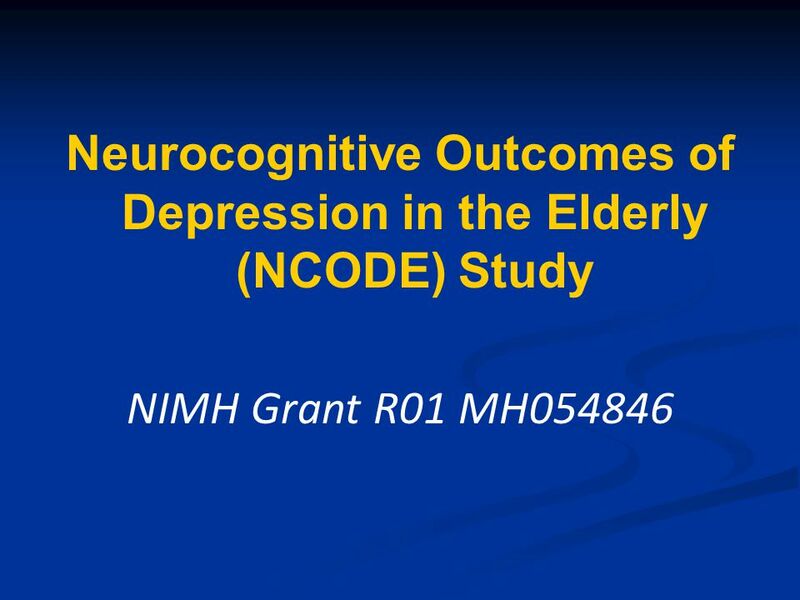 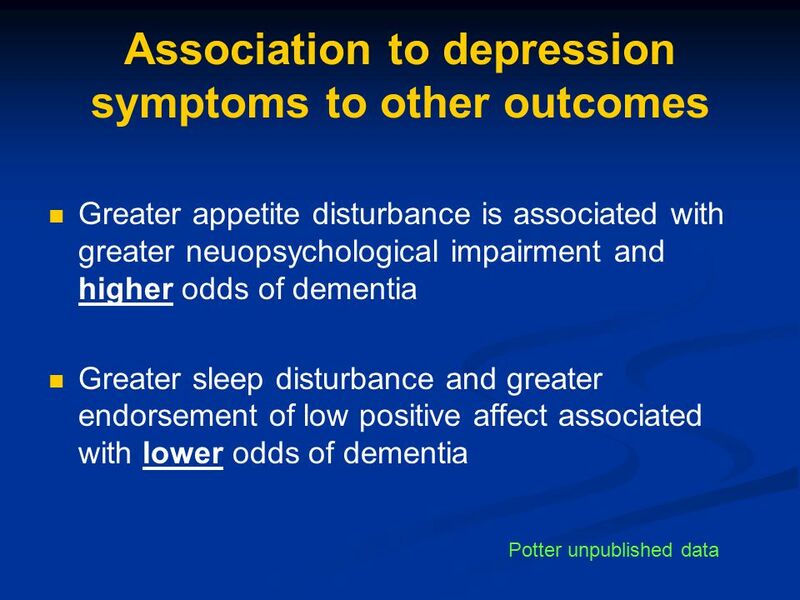 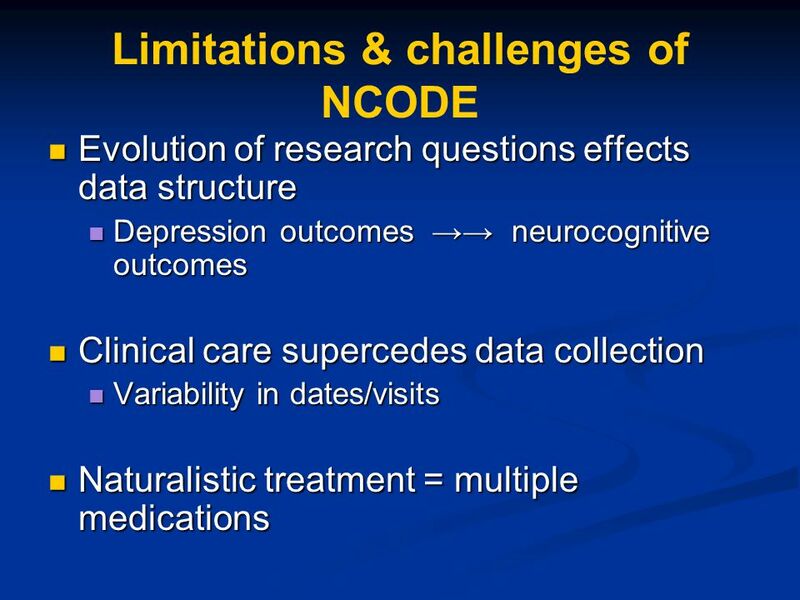 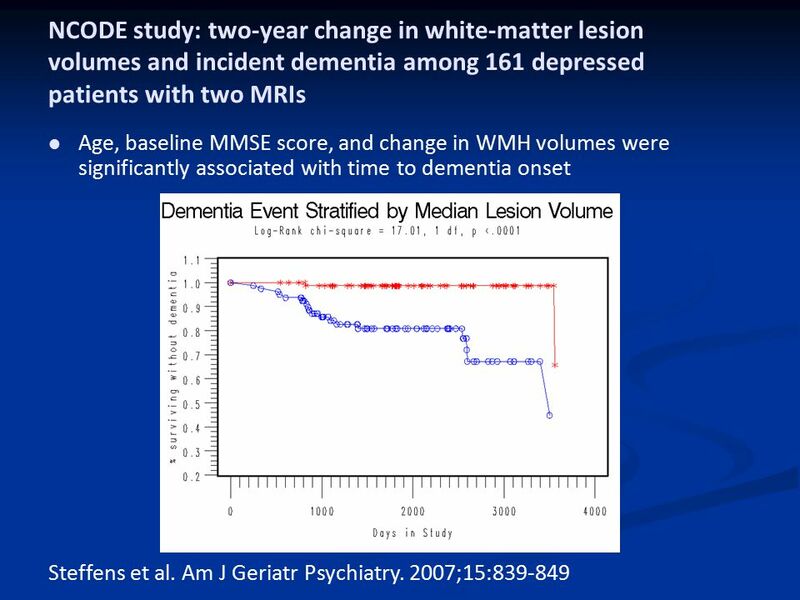 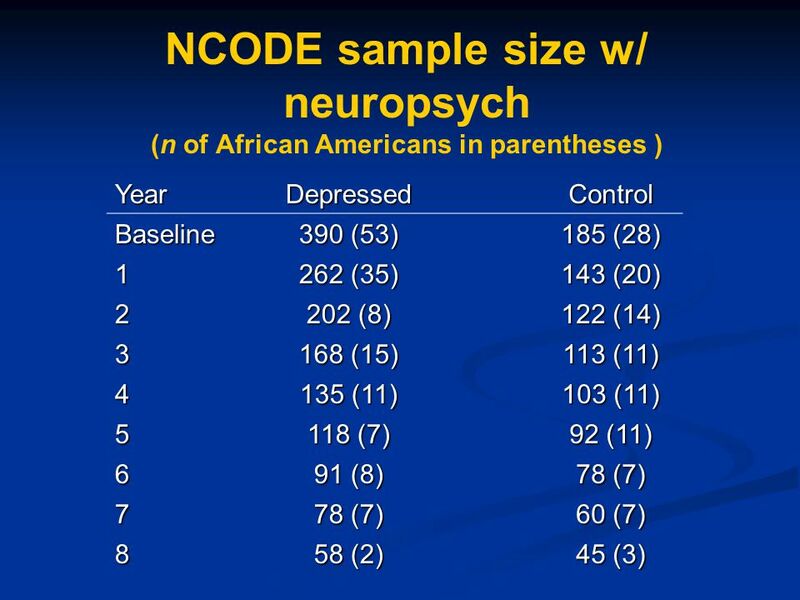 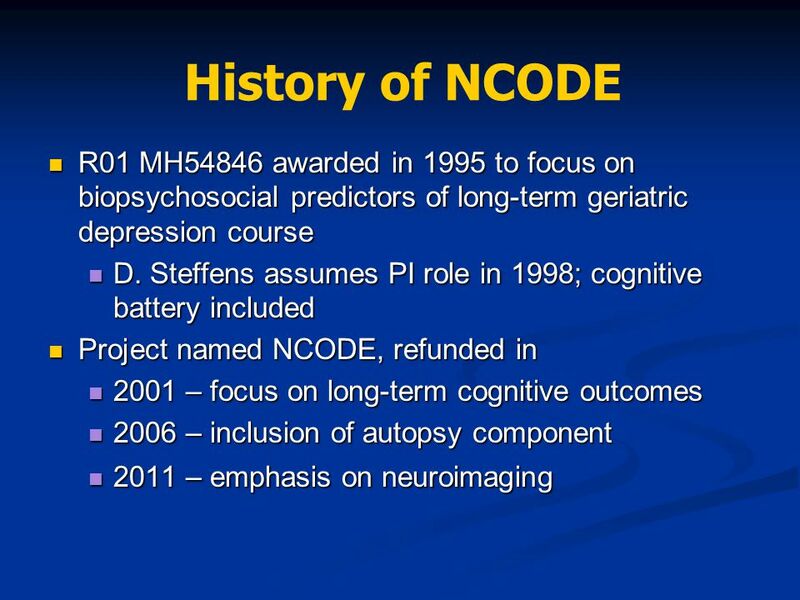 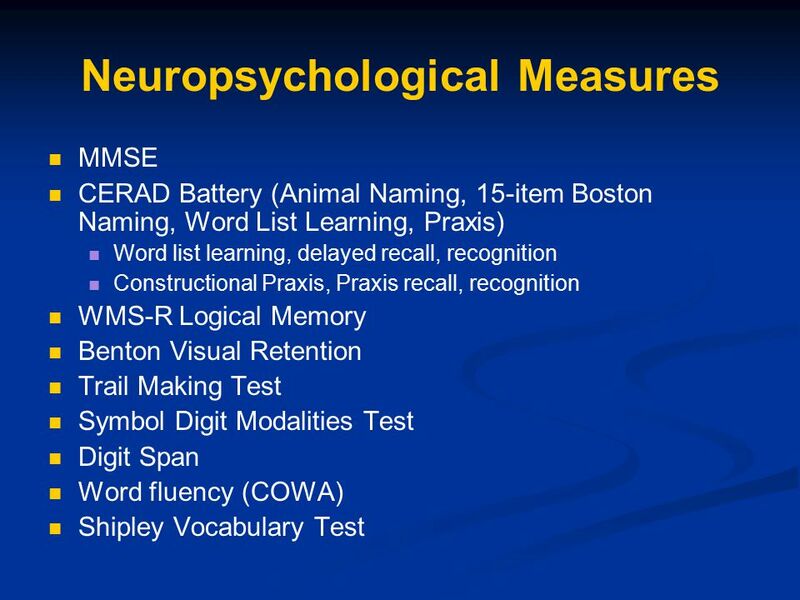 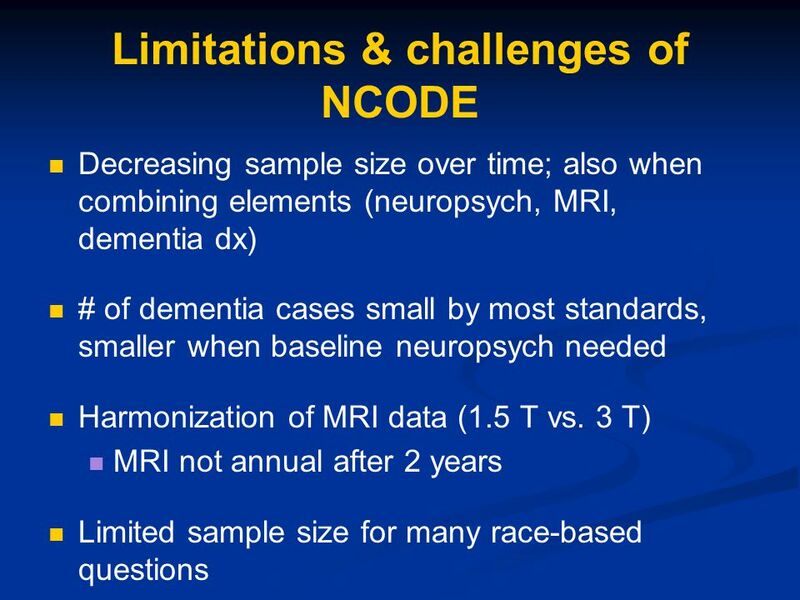 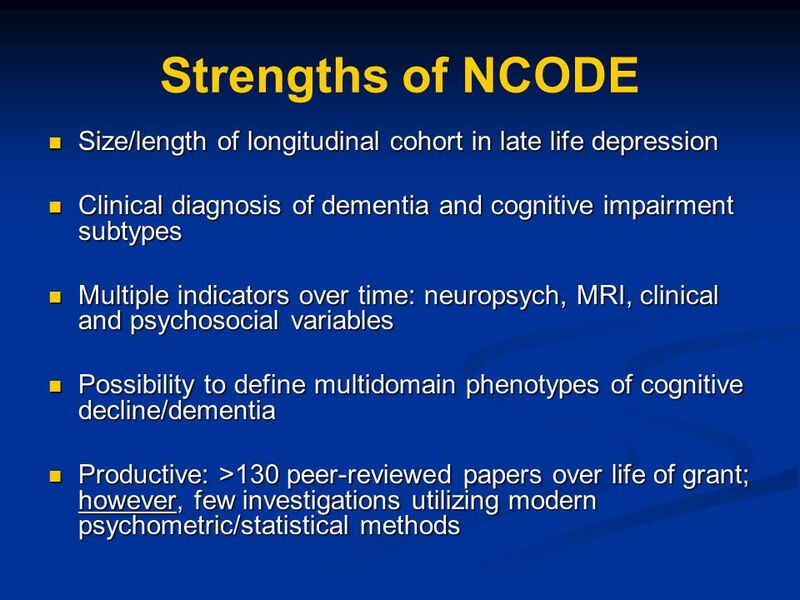 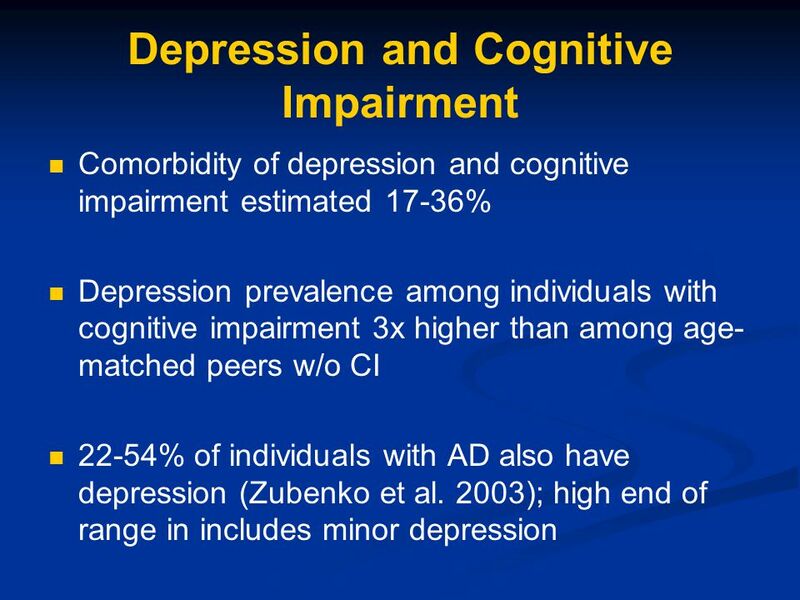 Download ppt "Neurocognitive Outcomes of Depression in the Elderly (NCODE) Study"
Combining neuropsychology and genetics in the study of mood disorders Daniel Smith MRCPsych Division of Psychiatry, University of Edinburgh Specialist. 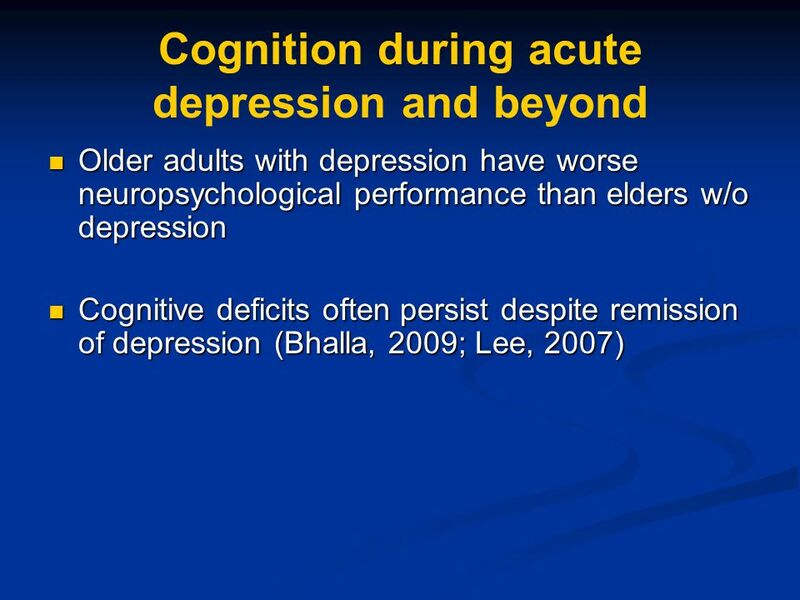 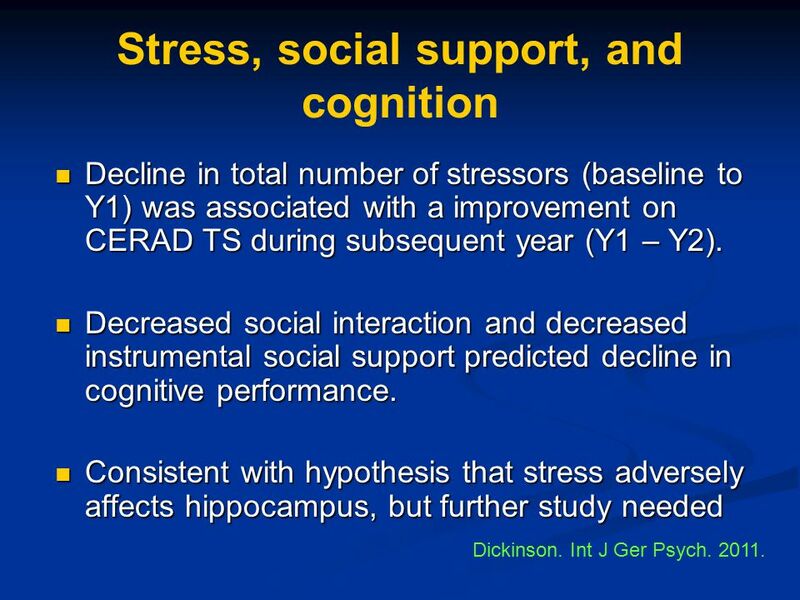 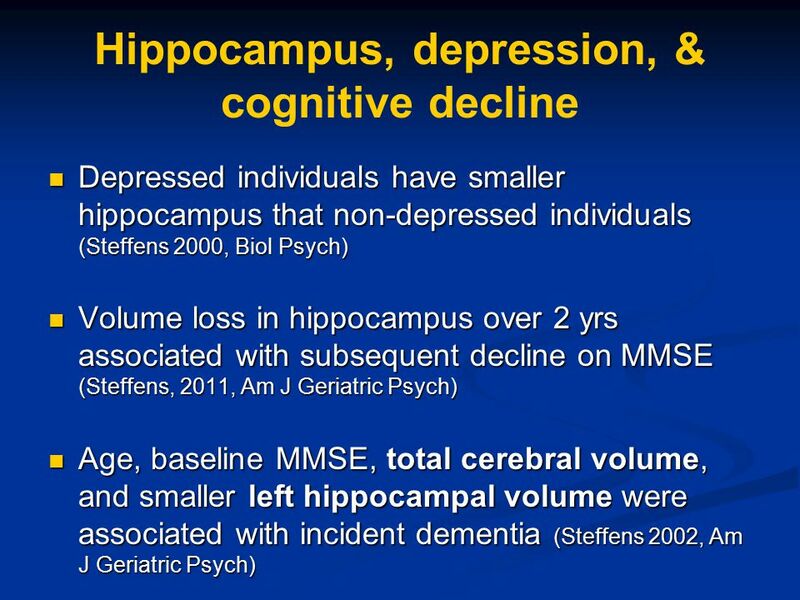 + Fuzzy Cognitive Map for Depression in Seniors Sara Namazi Math 800 Final Presentation November 30, 2011. 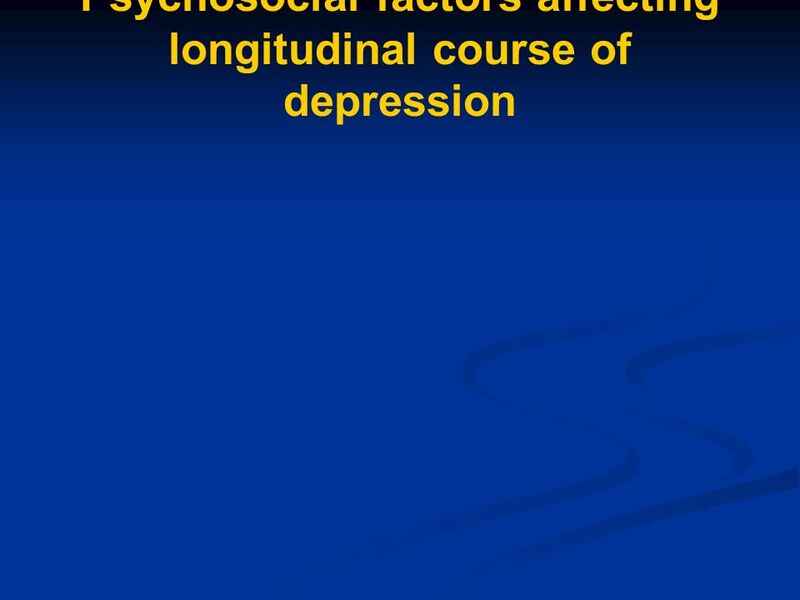 LESSON 1.4: DEPRESSION Unit 1: Mental Health. 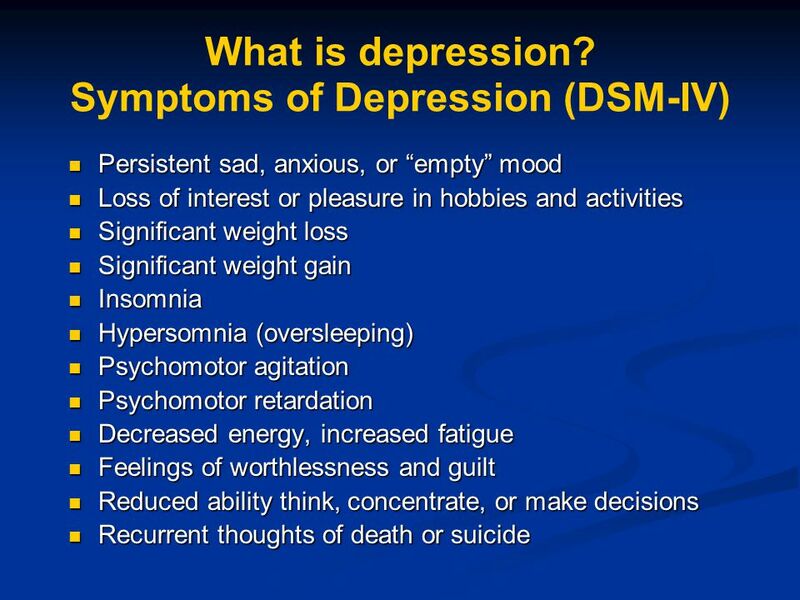 Do Now  Fill in the K-W-L chart with what you know and want to know about depression. 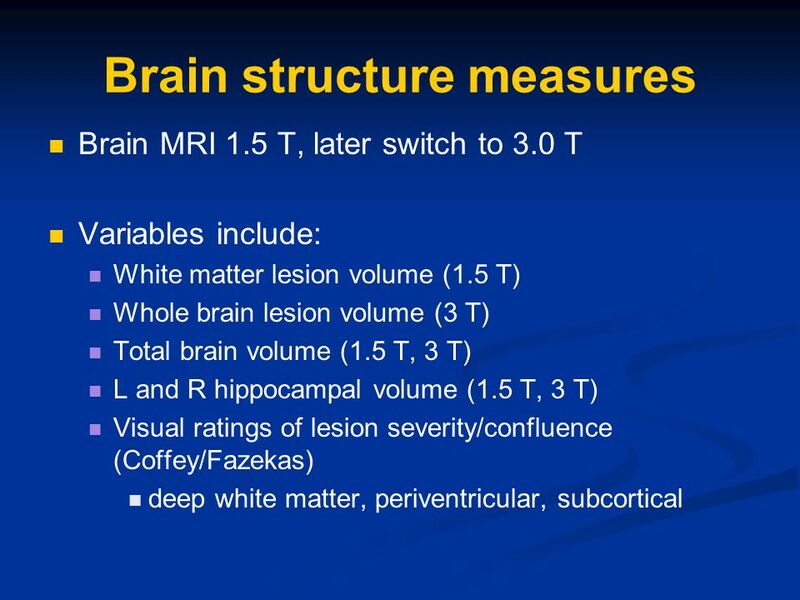 KNOWWANT TO KNOW. 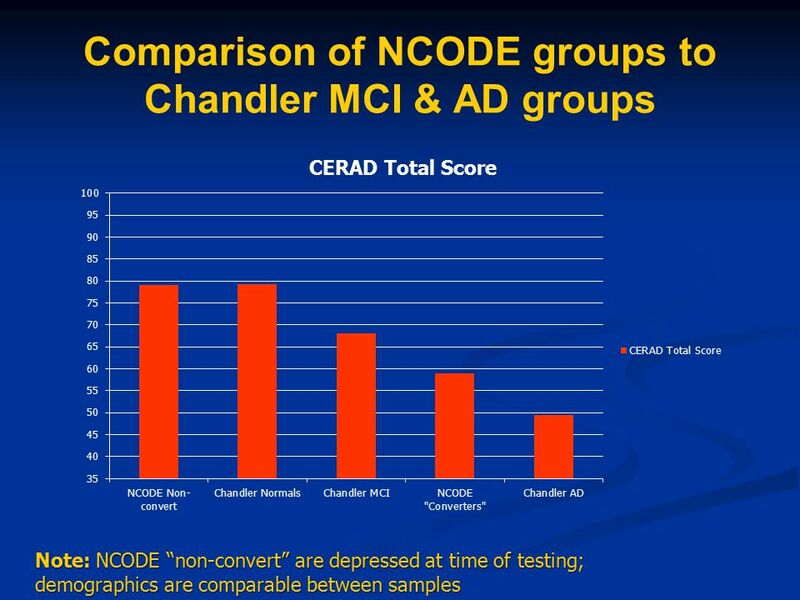 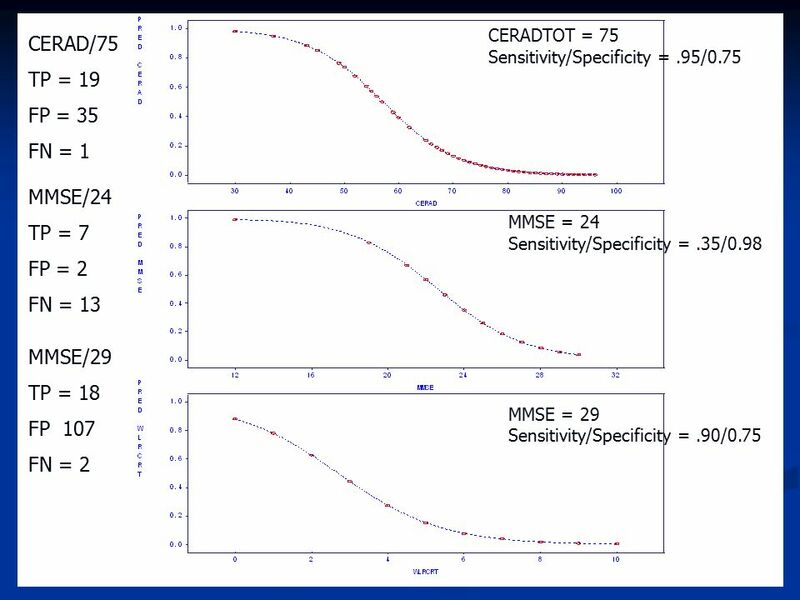 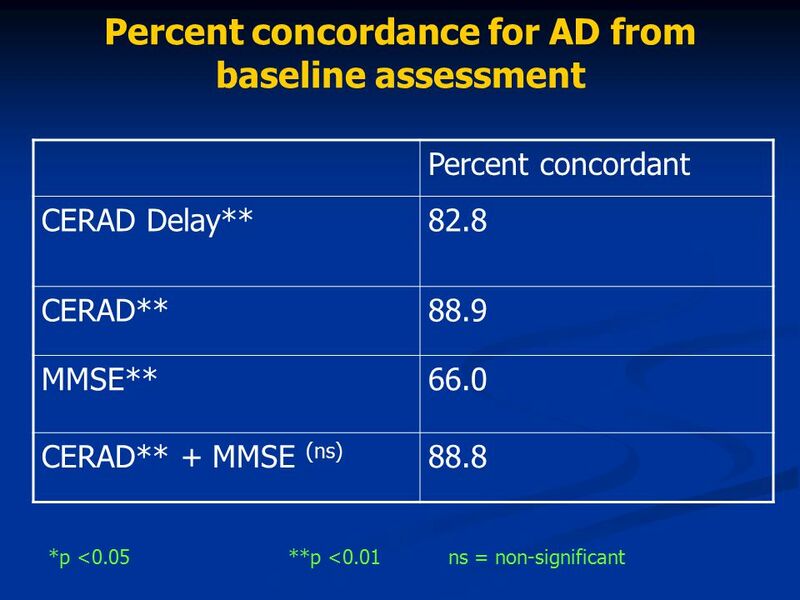 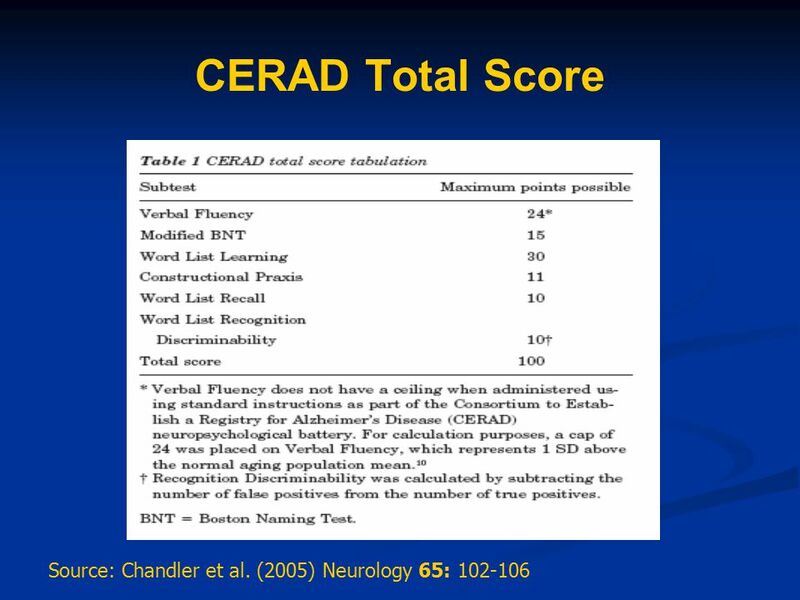 Mild Cognitive Impairment as a Target for Drug Development Steven H. Ferris, Ph.D. Silberstein Aging and Dementia Research Center New York University School. 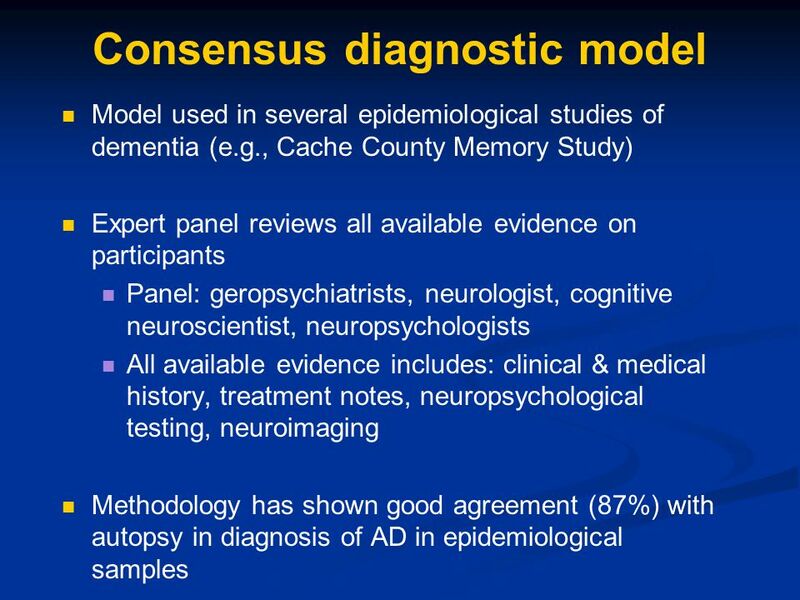 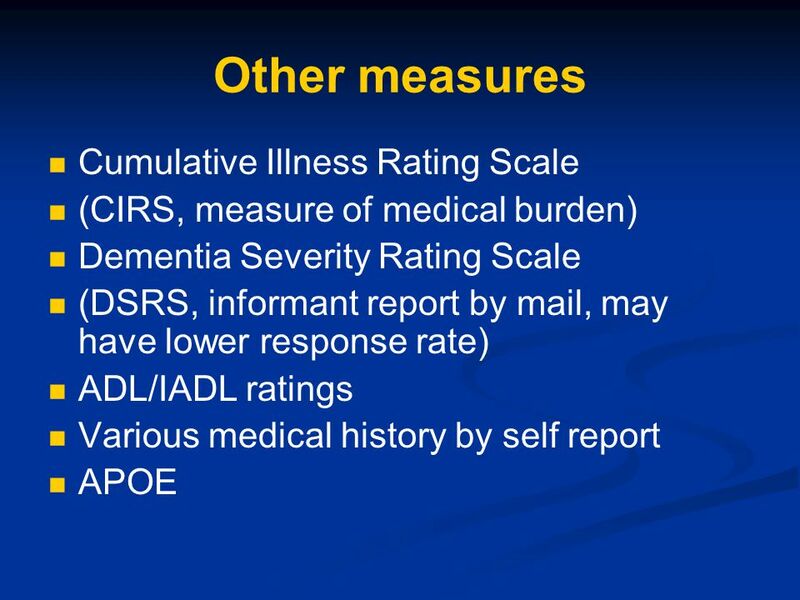 ACT on Alzheimer’s Disease Curriculum Module VII: Disease Diagnosis. 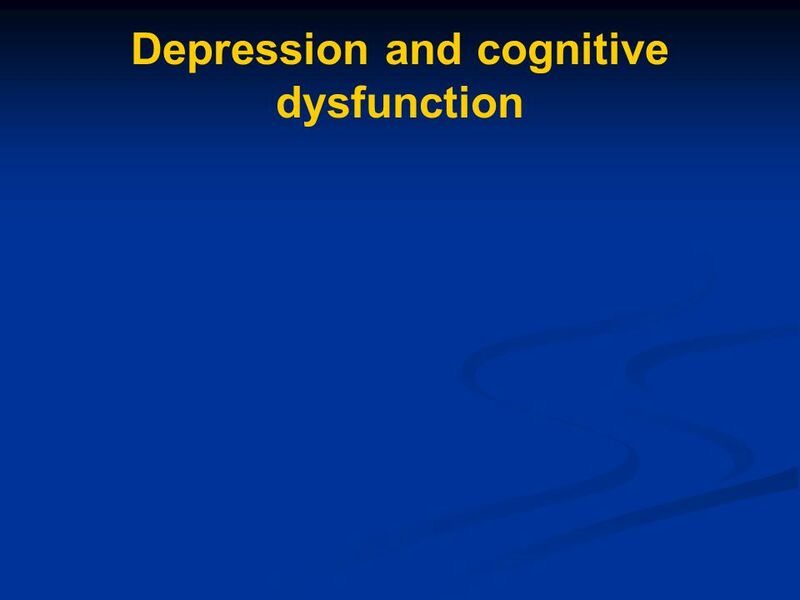 Depression Overview Developed by the Center for School Mental Health with support provided in part from grant 1R01MH A1 from the National Institute. 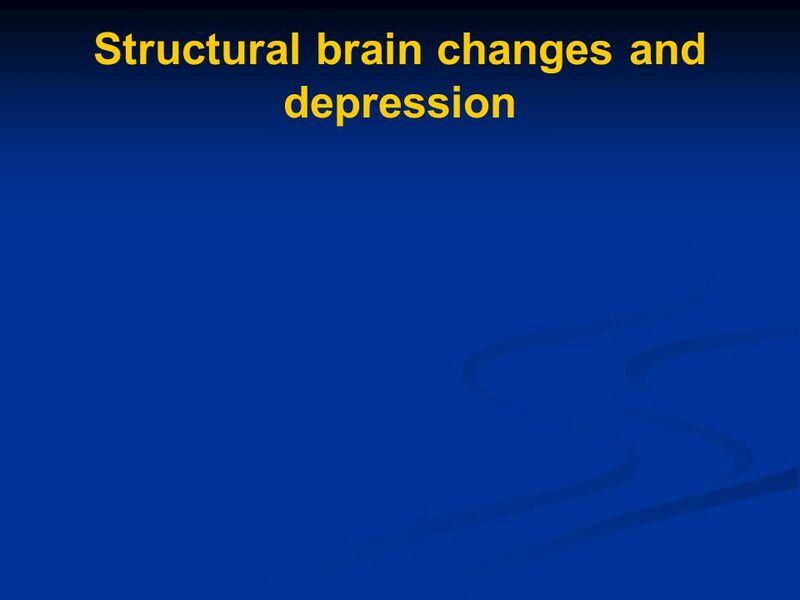 DEPRESSION IN SCHOOL. 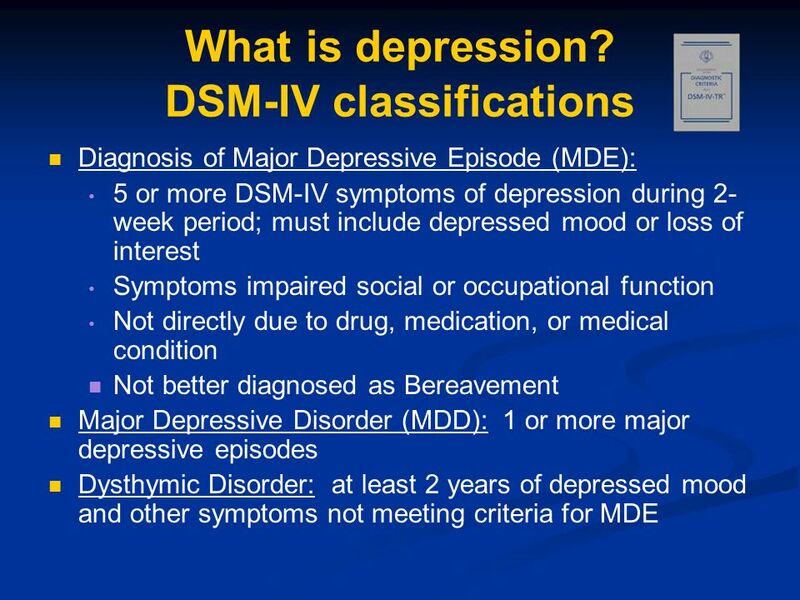 1.WHAT IS DEPRESSION? 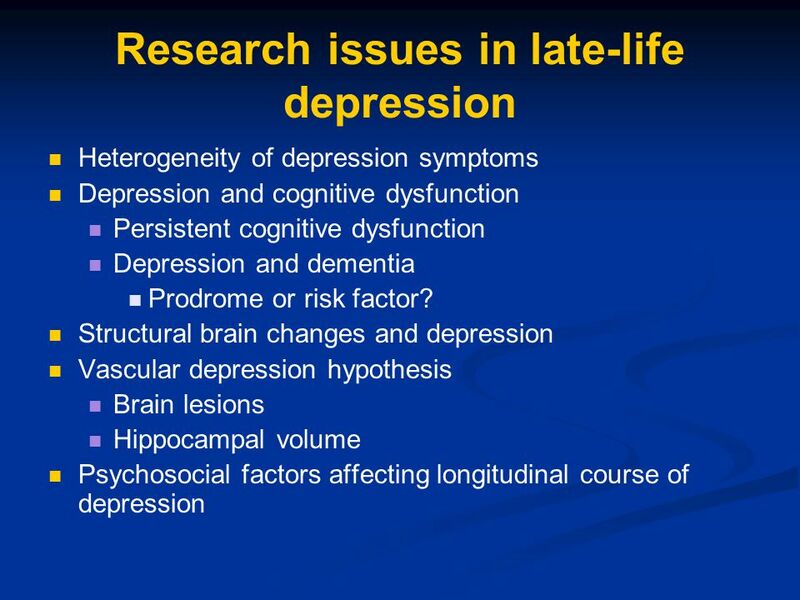 2.WHO SUFFERS FROM DEPRESSION? 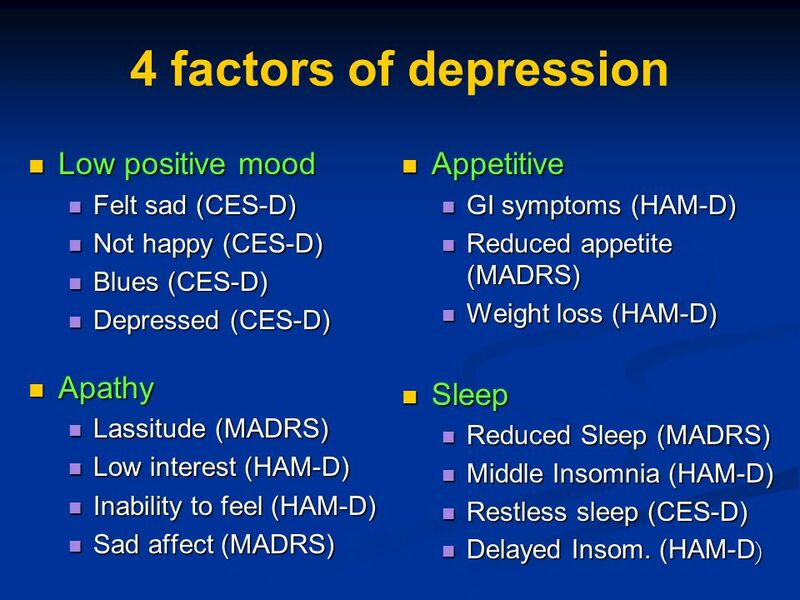 3.TYPES OF DEPRESSION. 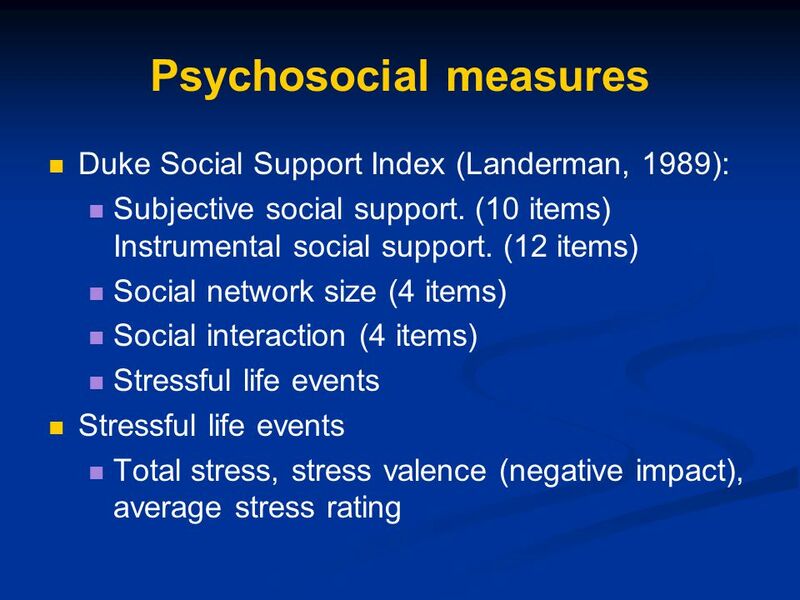 4.CAUSES. 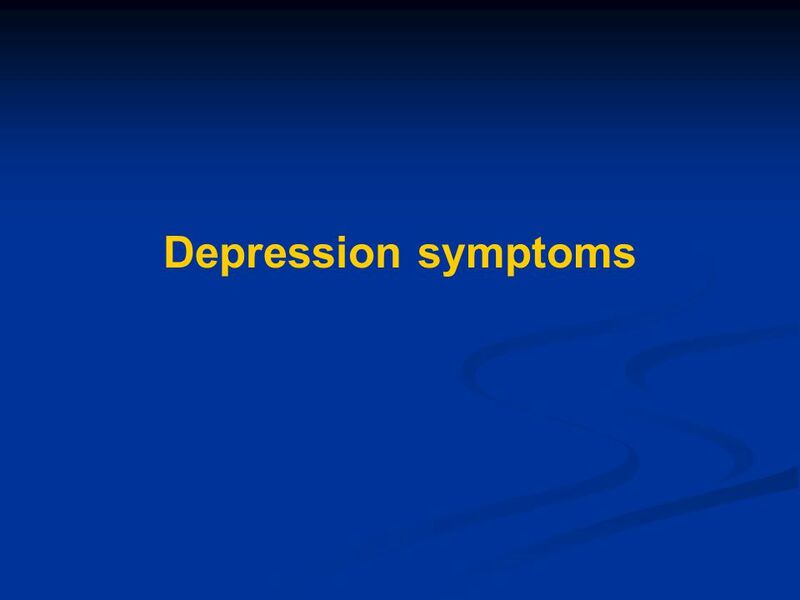 5.SYMPTOMS. 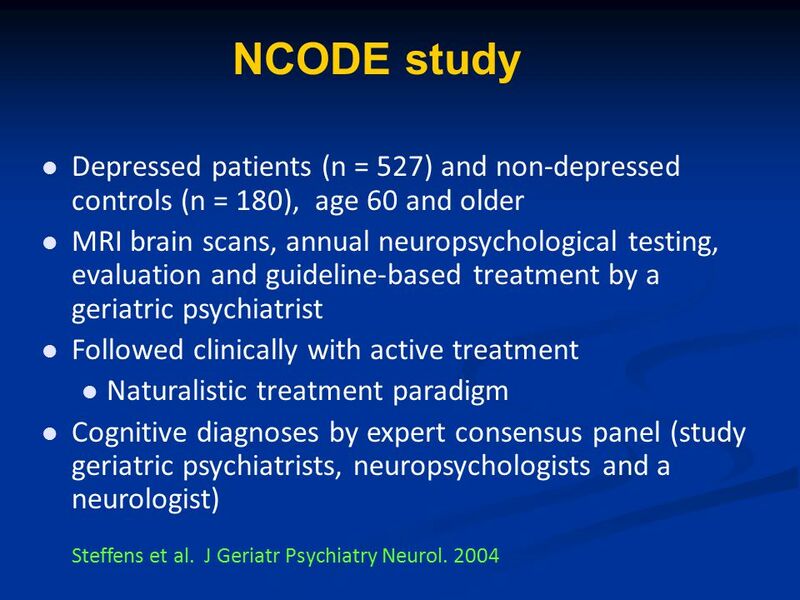 6.TREATMENT. 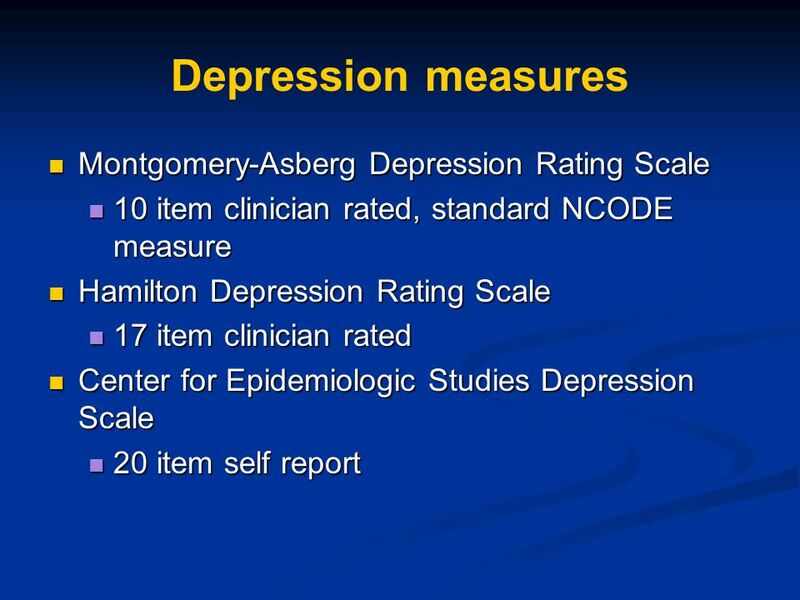 Detecting Depression in the Primary Care Setting Presented by: Jonathan Betlinski, MD Date: 09/15/2016.